« Where have you gone, John McCain? Winston Churchill said that Americans can always be counted on to do the right thing—after they’ve tried everything else. He could have been anticipating Nancy Pelosi. She tried to defend her pal, sleazy New York congressman Charlie Rangel, even after the House Ethics Committee found him guilty of violating House rules by accepting a corporate gift of a Caribbean junket. And more bad news to come from the committee. But protests from shocked (!) Republicans and panicky Dems have led Pelosi to do the right thing. 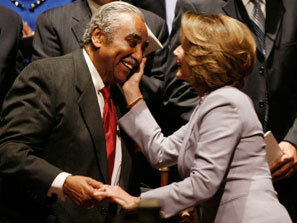 She informed Rangel today that he’s got to step down–probably Wednesday, according to the New York Daily News. This entry was posted on March 2, 2010 at 8:51 pm and is filed under Politics. You can follow any responses to this entry through the RSS 2.0 feed. You can leave a response, or trackback from your own site. I don’t think it’s correct to use the words “doing the right thing” and “Nancy Pelosi” in the same sentence, Bob…especially in this instance. As I explain over on Ethics Alarms..in a post dedicated to you!